Our costume policy is as follows: Dancers who choose to perform and/or compete must do so in our school costume. While we don’t require either performing or competing, any dancer who chooses to do so MUST have a costume. How you wear your hair is part of the costume. ALL girls MUST wear their hair up in a bun when performing and/or competing for the Culkin School. Remember that you all are representatives and ambassadors of the school. The school’s nice, neat, signature look is standard for all dancers. COSTUME NAME WHO NEEDS IT? BRIEF DESCRIPTION HOW CAN I ORDER? & Cost? Black jumper with Culkin Claddagh embroidered on the front, white shirt, white socks. Hair pulled off the face with white bow. This costume may be worn with a white turtleneck & tights instead of blouse in cold weather. Select sizes available for purchase at the Dress & Shoe exchanges in the Fall & Spring; Cost: $80. Black, gabardine fabric. dress with updated, modern design including celtic knotwork and red accent. 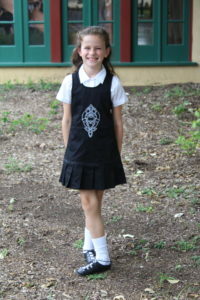 Culkin School dresses are made by Prime Dress Designs. Dress orders will be taken twice a year with delivery in January & October. Dresses must be ordered approximately two months before delivery date. Dancers at this level work with Culkin staff and professional seamstresses. Costs vary. Black performance tee, black pants (boys) or black cheer skirt with white bands and black tights (girls). The Performance tees are polyester with the Culkin “C” on the front and the website on the back. The boys shirts have a crew neck and the girls have a V-neck. Performance tee’s: available in the loft at Hughes throughout the year. Cost: $25. Black Cheer Skirts can be ordered online at our team store.Click here to order. Dancers purchase these items on their own. JC Penney is often a good choice! Vest orders are taken at the same time as the girls’ school dresses, in January and October. They are also made by Prime Dress Designs. Many Culkin gear items can be purchased online anytime during the course of the year! Track jackets, specialty shorts, sweatshirts, and Ts are available year round! If you are looking for some Culkin Spirit Wear OR if your dancer is in need of the new Performance/Pub Cheer Skirt, you can order these items on line! Just click here to place your order. If your dancer is in need of the Capezio BLACK Transition Tights, you can find them at some local dance stores like Repeat Performance, 5050-B Nicolson Lane, Rockville or Les Gals, 2337 Distribution Circle, Silver Spring. Please make sure to call them to see if they have what you need in stock before making the trip. You can also order them online. adults order Capezio Transition Tights #1916. We must wear a specified denier; #1816 & #1916 meet the requirements needed for both performances and competitions. The Leotard that should be ordered for the team costume is the Capezio Black Matte Long-Sleeved Leotard. Click here to order. ALL Culkin dancers who choose to perform or compete, are required to wear their hair in a bun – ON THE TOP of the crown of their head. SCRUNCHIE BUN: The “scrunchie bun” is worn by all dancers who are under the age of 10 for any performance and/or competition. Dancers over the age of 10 should plan to wear one for all Culkin School performances. Camelia Rose Wigs has created a bun just for the Culkin School. The Scrunchie Buns can be ordered at Shoe & Dress Exchanges. They are $20. CAMELIA ROSE ALLIYAH BUN: “The Camelia Rose Alliyah bun” is worn by dancers who are over the age of 10. All competitive dancers, over the age of 10, are required to wear this bun when competing. You can purchase the Alliyah Bun at feiseanna from vendors who carry Camelia Rose products and/or online. Please make sure to match your hair color correctly. For those dancers who have a Double Lucy Bun that is still in good shape, that is permitted to be worn. CAMELIA ROSE CIARA FULL WIG: “The Camelia Rose Ciara Full Wig” is worn by dancers who are wearing the championship skirt and leotard school costume and are in the U15 age group. NOTE that this wig is permitted FOR SOLOS ONLY. Please note that TEAM dancersare required to wear the Robyn Wig. CAMELIA ROSE ROBYN FULL WIG: “The Camelia Rose Robyn Full Wig” is worn by dancers who are wearing the championship skirt and leotard school costume and/or in the U15 age group. Please note that ALL TEAM dancers will be required to wear the Robyn wig. Click here for the Camelia Rose website. **PLEASE NOTE: that all buns and wigs can be ordered during Dress and Shoe Exchanges. The school has a color wheel to match hair and will place bulk orders for Culkin Dancers An email will be sent on the Yahoo! Group informing dancers when orders are going to be placed and how to match your hair**. Headbands for dancers who are wearing the Double Lucy or Alliyah buns are available from Head for the World. Headband orders can also be placed during Shoe and Dress Exchanges. All figures teams wearing the the Double Lucy or Alliyah buns are required to wear the school/team headband. You can look them up on FaceBook by clicking here. White barrette bows are available through Head for the World for $10 or at fall and winter Booster Club Consignment Sales. They are worn with the scrunchie bun and along with the headband when wearing the Alliyah bun. You can look them up on FaceBook by clicking here. The adult dancers at the Culkin School wear a simple black, long sleeve stretch velvet dress which can be made or purchased commercially. Please make sure to check with your instructor about current dress orders. We are currently updating our ordering process and will update the website as soon as everything is set. 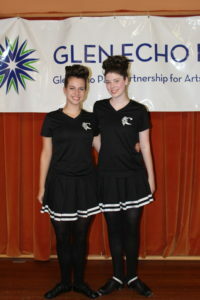 For major céilí competitions, the adults add a white competition shawl and white cuffs, which are provided by the school. Many of you have asked what the “loft” is and how to find it! The “loft” is a storage area at Hughes United Methodist Church, 10700 Georgia Avenue in Silver Spring that acts as a consignment shop for gently used items as well as a few new items for dancers to purchase directly from the school. What can you find in “THE LOFT”? You can find new and gently used items to purchase directly from the school. Here is a list of items currently “in stock”. HOW DO I PURCHASE ITEMS FROM THE LOFT? To purchase items from the loft; plan a visit to Hughes UMC or request items from your instructor to bring to next week’s class. Please make sure to have a check ready & written out to the Culkin School to give to your instructor. Don’t forget to mark the item you’ve purchased on the memo line. Cash is accepted. If you plan to go to Hughes, UMC, please double check the weekly schedule to make sure classes are on so you can enter the hall. Click here for the Full-Year Class Schedule If you are unsure of this procedure, please just email or talk to your instructor and they can help guide you. HOW CAN I SELL OR DONATE MY GENTLY USED ITEMS? Donating your item is easy–simply drop your item off at Hughes’ loft area marked “donation”. You may also request your instructor to take your item to Hughes, UMC for you. To SELL your gently used items, you must list them in the Booster Club Newsletter or on the Culkin Listserv (Yahoo! group). HOW DO I ORDER A NEW COSTUME? Spirit wear items, such as tracksuits, bags, and other items are available through the Booster Club. Items are generally available twice a year (fall and late winter)- however, some products may be available year round. Please click here to visit the Booster Club Spirit Wear page for more information.